When was the last time you visited Lincoln Park Zoo? The zoo always has plenty of things to see, but cooks and gardeners should certainly check out the Edible Gardens at the entrance to the Farm in the Zoo. I was interested in the cucumber vines trained to grow on wire grids set at an angle to lift the vines and fruit up off the ground, and to keep them from choking out everything near them – a problem in my own garden. Even more interesting was the large variety of cucumbers being grown. Beyond the typical salad cuke and pickling type, Edible Gardens grows Salt & Pepper, Sultan, Mexican Gherkin, and Poona Keera whose shapes and colors vary tremendously. With a handful of market cukes, I headed to the kitchen to find a way to compare their individual features. 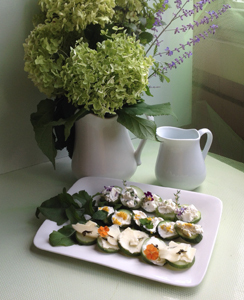 I settled on making updated open faced cucumber sandwiches so that the different varieties could stand on their own. I recommend you head to the market and pick up some cucumbers plus crusty bread, some locally made goat cheese and a handful of your favorite herbs and do the same. Perfect for a hot summer evening picnic, these celebrate the season with crisp fresh flavors, and celebrate your creativity with different toppings and herb mixtures. Drop some slices into a pitcher of ice water or make a cucumber gimlet and make a toast to the best of August in a Chicago garden! Mix cheese, herbs and salt and allow to stand at room temperature 20 minutes or in the refrigerator up to 12 hours. Spread cheese on cucumber slices and top with your choice of garnishes. Serve immediately or wrap tightly in plastic wrap and chill.